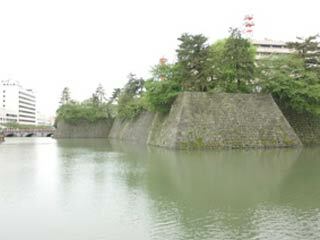 Fukui Castle (福井城) is the ruins of flatland castle located in Fukui. It was built by Yuki Hideyasu, the 2nd son of Tokugawa Ieyasu. There is the main bailey and its moat and stone walls are still remains in great condition. Hideyasu gathered many great designers and architects to built a great castle for Matsudaira clan. It was used be called Kitanosho Castle, but Hideyasu changed its name to Fukui, because Kita, literary means north, contains the meaning of losing. There is no parking, but you can find coin parking around the castle. Built in: 1601 by Yuki Hideyasu. Before Hideyasu, Shibata Katsuie built a great castle here. Shibata Katsuie was one of the general of Oda Nobunaga. After the demolition of Asakura clan, Katsuie was given this land from Nobunaga. However, after the death of Nobunaga, he lost Toyotomi Hideyoshi at the battle of Shizukadake, and he died at Kitanosho castle with his wife Oichi. Current ruins of the castle are all built by Hideyasu. The west entrance and its bridge, called Gorokabashi, are reconstructed, and the base stones of Tenshu-kaku remains in great condition. The second son of Tokugawa Ieyasu, Yuki Hideyasu, born in 1574, was the first daimyo (feudal lord) of Echizen. His younger brother Hidetada was the 2nd Shogun in the days of the Edo period. Hideyasu was adopted by Toyotomi Hideyoshi in 1584. Soon after that he wasadopted again, this time into the Yuki clan, a noble samurai clan from Kanto. Hideyasu was dispatched to Echizen, presumably to control the Maeda clan in Kaga, the biggest independent Daimyo. It was Hideyasu who began a major upgrade to Kitano-sho Castle and castle town. Thus, he dug the Hyaken Moat, using the course of the Yoshino River; built the 40 meter high Tenshu-kaku; and expanded the castle town. In the 1607, Hideyasu succumbed to a fatal illness at the age of 34. However, Echizen Matsudaira clan kept high rank among daimyos, second to the three Tokugawa families. The 16th lord of Fukui, Matsudaira Yoshinaga is famous as a wise political adviser to the last Shogun, Tokugawa Yoshinobu, who found himself in quite a troublesome situation of the last days of Edo period.